Ancient Salento belonged to Magna Graecia, the part of southern Italy settled by the Greeks in the 8th century BC, and its original inhabitants were the Messapians. There is a strong imprint of antiquity in Salento, but the peninsula has been ruled by so many different waves of conquerors during the centuries since the Greeks that its history is now complex and mixed. It boasts incredible culture, offering great archaeological heritage, beautiful art and craftsmanship, fascinating ancient traditions, stunning landscapes, dreamlike beaches and excellent gastronomy. 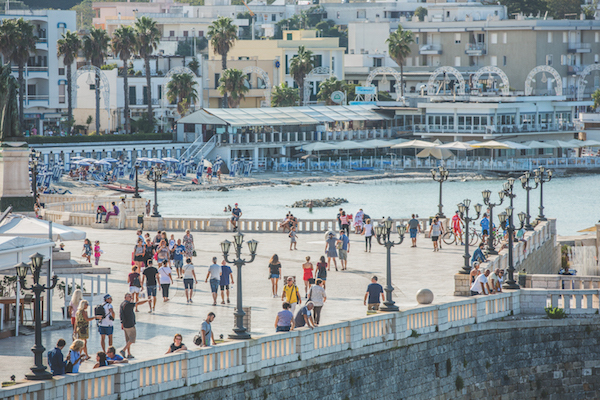 A 20-minute train journey from Brindisi takes you to Lecce, the largest city in Salento. Locals we had talked to during our trip around the northern part of Puglia had recommended it highly, proudly referring to it as the ‘Florence of the South’. On reaching the historical centre it was clear as to why the Leccesi are so passionate about this city. During the day, the city’s stone is a striking yellow that turns into an incredible pink after sunset. Seeing Lecce’s wonderful sandstone palaces and structures throw off the most warming glow as the sun sets in the evening, we couldn’t wait to get immersed in this city. Strolling through the cobbled streets you’ll notice how smooth the Levantine stone pavement is, gleaming and silky like it had just been meticulously polished. 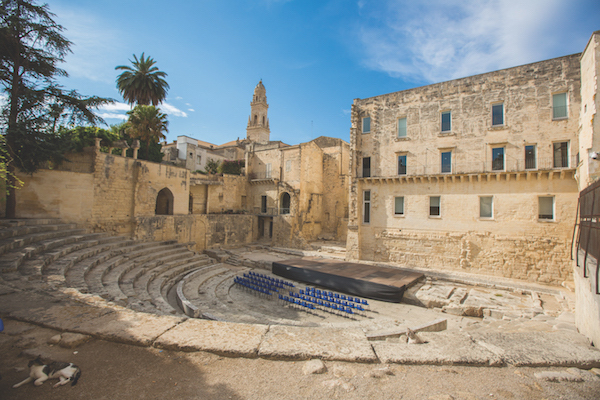 With its monumental entrances, grand centro storico, Piazza Sant’Oronzo, impressive Roman amphitheatre and majestic Baroque churches on every corner, what really stands out is how completely different Lecce is from the small coastal towns and inland villages of Puglia. Yet although Lecce is large and there is so much to see and take in, the city does not feel ostentatious and the atmosphere is relaxed. Fabulous Lecce architecture – make sure you look up! 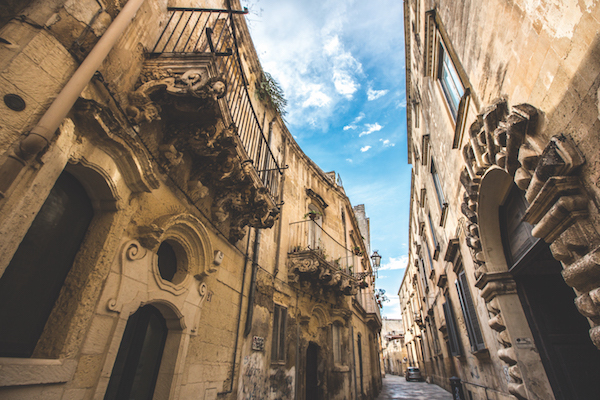 Lecce is also a vibrant university city with a young generation injecting vitality into its streets and shaping the scene at many of its bars, restaurants and other hangouts. It also has its boutiques, artisan makers, antique, flower, food and flea markets, large bookshops and art galleries. The city certainly provides plenty to see and do. The Baroque churches, palaces and balconies are adorned with decoration, so make sure you look up! Saints, cherubs, human and animal figures, heads and gargoyles are in abundance. Everywhere you look there is some odd creature or other staring back at you. The Basilica di Santa Croce, with its lavishly decorated façade, represents the apex of this Baroque decoration – a mind-blowing explosion of stone figures. At the centre of this allegorical feast stands the famous Romanesque rose window with its ring of laurel leaves and berries. We walked to the elegant Piazza del Duomo at the junction of Via Giuseppe Libertini and Via Vittorio Emanuele II. 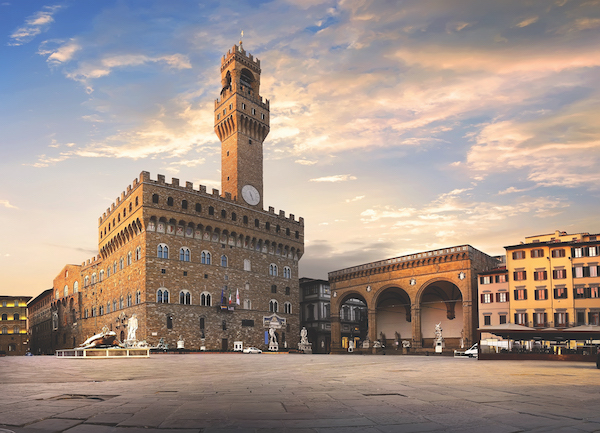 Enclosed on the other three sides, the piazza is completely surrounded by Baroque buildings: the Cathedral, Bishop’s Palace, Seminary and the soaring bell tower. On the left side of the square you will find Marco Epicochi’s Laboratorio della Cartapesta (papier-mâché workshop), www.cartapesta-lecce.it. 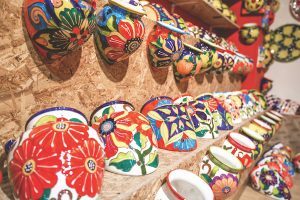 Papier-mâché has been famous in Lecce since the 17th century and the importance of this ancient art to the city is so great there is a museum dedicated to it in the Charles V castle. Known as the ‘poor man’s marble’, take home a piece of cartapesta art or try a class to learn more about this noble craft. When we went to Marco Epicochi’s workshop, he was intently working on restoring an ancient religious piece. His small studio is bursting at the seams with his art; statues representing holy subjects, professions and peasants are all on display. The detail of his craft is fascinating, with the garments seeming to flow, such is the expression of the artist. Marco learnt this art by working alongside his grandfather and he still uses traditional methods. Not only should Lecce itself be the must-see during your stay in Puglia, it is also the perfect starting point to reach many of the heavenly beaches that are scattered along the coastline. 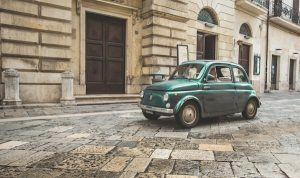 Although there is a well-established, inexpensive and reliable bus service (Salento in Bus) that interlinks many of the beach and coastal destinations, I would recommend hiring a car as the journeys by coach can become crowded. We stayed in Lecce for five nights in one of the excellent rooms at Le Bifore Charming House and used that as a base before moving to Gallipoli for a couple of nights and finally on to Porto Cesareo. 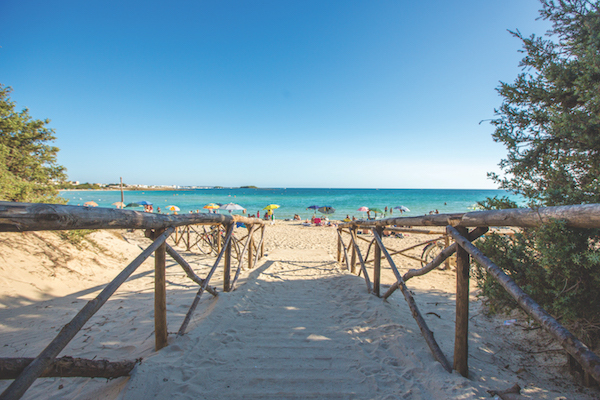 The beaches and translucent sea that are a short distance from Lecce really are special. 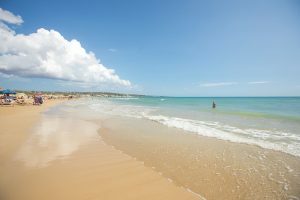 An example of these is the fabulous beach of Torre dell’Orso (located in the Marina di Melendugno, in the province of Lecce) which is only about half an hour’s drive from Lecce. This is a thin stretch of white sand (around 1km) with crystalline blue water, particularly transparent thanks to currents of the Canale d’Otranto. It is surrounded by calcareous rocks full of interesting caves and has a lush pine forest as its backdrop. This lovely bay is known for being home to the famous twin rock stacks called the Due Sorelle, the Two Sisters. Also nearby in Roca Vecchia, you will find the picturesque Grotta della Poesia (the Cave of Poetry) – one of the most beautiful natural pools in the world and very popular for diving. According to an ancient legend this is the location where a beautiful princess used to bathe, and it has inspired many a poem. Around 30 miles southeast of Lecce is Otranto, a very ancient town of Greek origin. In Roman times it was important for being the nearest port to the eastern shores of the Adriatic Sea. During our visit an extravagant wedding was taking place in the Castello Aragonese, the impressive 15th-century fortress that today hosts exhibitions and cultural events. The entrance was adorned with flowers and outside the chauffeur was waiting in his smart car alongside many locals who were eagerly waiting for the newlyweds to appear. This old town is small but beautiful, boasting a labyrinth of narrow streets, a dazzling 11th-century cathedral with magnificent mosaic floors and the tiny frescoed church of San Pietro, which is one of the best examples of Byzantine buildings in Puglia. Beyond the old town there are bars and restaurants overlooking the curved bay, providing some lovely alfresco dining options. Just over an hour’s drive from Lecce, towards the southern end of the region, you will find the Marina di Pescoluse. It is in this area on the Ionian coast, 10km from Santa Maria di Leuca, between Torre Vado and Torre Pali, that the famous Maldives of Salento are located. The coastline is low and sandy and the sea appears to increase in vibrancy the closer you get to Pescoluse. 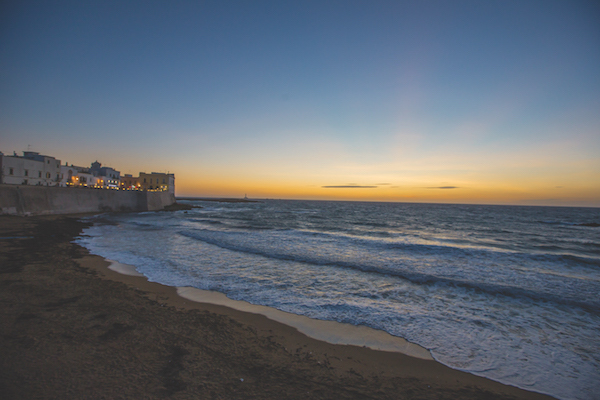 Just over half an hour’s drive south west from Lecce you will reach Gallipoli, which is a city of two parts. After passing through the modern part of the city, which lacks any real ambience, we finally reached the old centre. Old and new stand face to face, with the castle standing right in front of a huge, anonymous modern building. Crossing the ancient bridge connecting new to old, the feel of the place completely changes. This old city is well preserved, and although the original city design was aimed at confusing and delaying invaders, you can now safely navigate the maze-like streets, cobbled alleys and pretty courtyards. 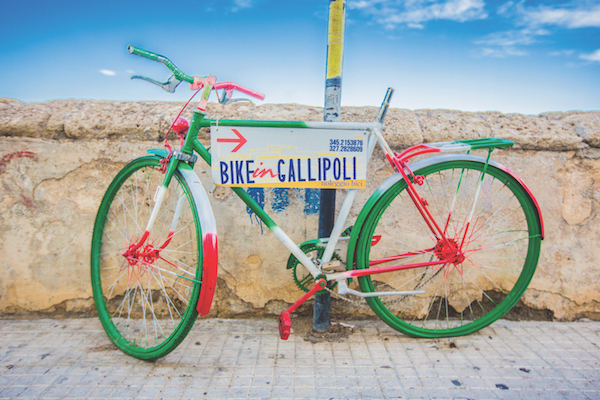 Gallipoli offers typical southern Italian scenes, with clothes hanging outside windows and across narrow streets, elderly men making fish nets and weaving crab pots and animated women who are either arguing or merely chatting intently – it’s hard to tell! Many of the houses have their doors open through which you catch a glimpse of local life – TV on, kids doing homework and the aroma of delicious meals wafting out into the streets. lots of hire shops along the sea walls, where you can also enjoy views over the Spiaggia della Purità and the pretty harbour. Our next stop was to nearby Porto Cesareo, still on the Ionian coast, slightly to the north. This is a tranquil village with a beautiful port and a fish market. A long stretch of beach (17km) faces an archipelago of islands that forms a protected bay. Porto Cesareo belongs to the Protected Marine Area and to the Regional Nature Reserve Palude del Conte e Duna Costiera, one of the largest in Italy. With its shallow, calm and translucent sea this is definitely one of our favourite beaches in Puglia. We cycled from the centre of the village to Torre Chianca and Torre Lapillo. These stone watchtowers were built in the 16th century to protect the coast from Saracen attacks. If you are fitter than us and can resist stopping on the way to gorge on focaccia, you can probably venture all the way to Punta Prosciutto (Ham Point), a dreamlike beach with Caribbean-style water – and a rather unusual name! 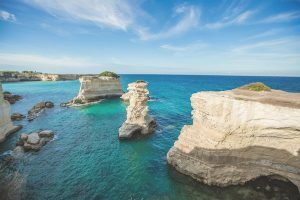 Click here to check out our Salento travel guide, including the best places for food, accommodation and great places to visit.